Federal health authorities have determined responsibility for the vast 26-state outbreak of Listeria in cantaloupes, almost three months — and 123 illnesses, 25 deaths and one miscarriage – since it began. In a long report released this week, they say they found Listeria not in the fields where the melons were grown, but in the packing and cold storage facilities on the single large farm where they all came from; and, in addition, they identified some practices on the farm that may have caused Listeria contamination or allowed it to multiply. Just as a reminder of what was at stake here since we last talked about it: This is the first time that Listeria was found on cantaloupe in the United States, meaning there wasn’t a lot of past science to draw on. And this was a huge outbreak: The farm had 480 acres in cantaloupe, and shipped more than 300,000 cases of it. The number of fruit involved, according to MSNBC.com, may have been as high as 4 million. Facility design allowed for the pooling of water on the packing facility floor adjacent to equipment and employee walkway access to grading stations. The packing facility floor was constructed in a manner that was not easily cleanable; the packing equipment was not easily cleaned and sanitized. The washing and drying equipment used for cantaloupe packing was previously used for post-harvest handling of another raw agricultural commodity. There was no pre-cooling step to remove field heat from the cantaloupes before cold storage. Brief background: Listeria is a difficult bacterium to track because it’s widely distributed in the environment, hardy, causes illness after a pretty small infective dose — and, crucially, can have a long incubation period between ingestion and symptoms, often several months. It likes damp, and it also has the unique evolutionary trick of liking cold; unlike other foodborne organisms, Listeria will happily keep growing on something that has been refrigerated. So, the investigation: To start with, the FDA and its research partners, including the CDC’s disease detectives, looked at the fields where the fruit was growing. They checked the remaining fruit, the furrows they were planted in, the soil, the irrigation water and also pond water, and wild-animal droppings. There was no Listeria in any of the samples they took. Then they turned to what happened to the cantaloupe after they were plucked from the fields — and here the investigation yielded results. They swabbed the packing facility — a building where the melons were separated by size and quality, washed, packed, held in cold storage and shipped — in 39 locations. Thirteen of the swabs yielded the same Listeria strain that they had recovered from several patients who were sick with listeriosis and had eaten cantaloupe. When they looked for conditions in the plant that could allow Listeria to multiply, they found water, and dirt. The inspectors identified another intriguing issue. When the cantaloupe were carried in from the fields, they were warm of course, being grown in the summer, in the sun. They were transported directly to cold storage to keep them fresh as long as possible. 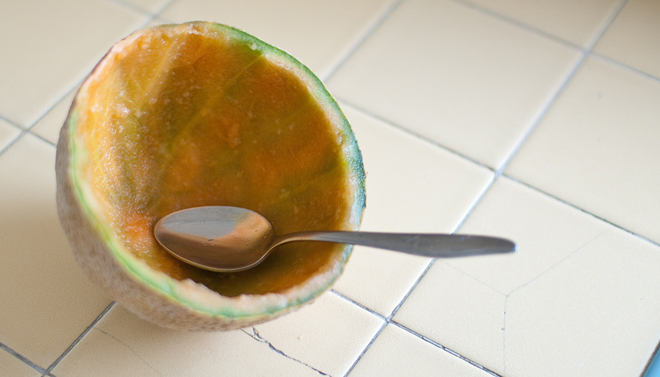 Too directly, as it turns out: They went from one state to another so quickly that as the fruit cooled, condensation developed on its rind, providing yet another source of the damp cold that Listeria prefers. Those are the conditions that the FDA contends allowed Listeria to multiply on the cantaloupe. But where did the bacterium come from? That may never be answered; it may have been present in drains or on uncleanable packing-house surfaces for so long that the question is not useful. And the inspectors admit they cannot rule out contamination occurring out in the fields; the samples they took once the outbreak was tracked to the farm are not sufficient to rule out some sporadic presence of Listeria outdoors. But they did find one tantalizing clue. Among the many places that it flourishes, Listeria likes the guts of ruminants: deer, goats, cattle. The farm could not use all the cantaloupe that it harvested; some of the fruit was bruised or imperfect or for some reason not sellable, and so they sold the rejects instead to another farm nearby. It was a cattle farm. In between trips, the truck that carried the culled fruit back and forth to the cattle farm was parked next to the packing house. Did it shed Listeria into the nearby environment, or onto the hands or clothes of packing-house workers? The FDA raises the possibility, but doesn’t otherwise say.